With school spring break around the corner, plan active play dates, parties and/or vacations. 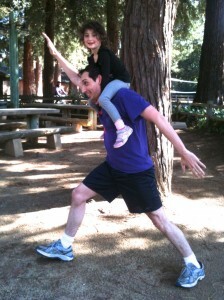 It’s more fun, memorable, and (oh yeah), you’ll squeeze in exercise at the same time! -Take a walking tour of cities and towns. Try a gourmet walk from chocolatier to bakery, a walking comedy tour (I’ve done it; it’s fun!) or make your own tour. Let your kids pick a destination and walk to it. -Plan an active play date with another family. Try some of the games on this website such as running Scrabble, a scavenger hunt, Letterboxing, Tri Day or go on a simple hike. One of our favorite things to do as a family is go hiking with friends. One Dad I know concocts intricate stories involving their kids’ stuffed animals as the children walk along riveted to his tale. -My neighbor and his son are already on vacation. 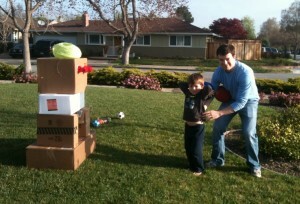 This morning, they were starting to play their home-made Angry Birds Game in 3-D. They are working on a slingshot to go with it. Think they’ll have a blast and get some exercise chasing after the balls and boxes? His son will get the side benefit of a great day with Dad all while having a blast learning physics. So fantastic! -Regardless of whether you go away or stay home for a vacation, make it active (and therefore, much more fun and memorable)! Rent bikes in a new town and just explore with no agenda. Or ask the bike shop for local bike trails. Find a new pool, lake or beach to swim; snowshoe from hut to hut; roller-skate to the ice cream parlor or have a dance party. By three, my son was able to ice skate by himself. So I just skated alongside. If you can, “practice” your activity beforehand so you can ride/ski/hike/etc. comfortably for days in a row. -Try the jumpy places that have walls and floors made of trampolines. They are all over the U.S. Or go to your local park for free and jump on all the wobbly bridges and bars. I know I’m not the only adult who does it because I’ve seen others play along too. 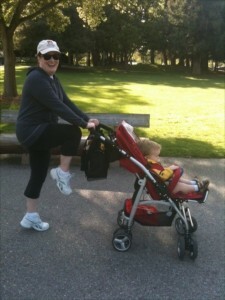 Make the park active time for all of you, rather than sitting and watching your kid play. You’ll get a workout, and your kids will feel like you really played with them and didn’t just “watch”. Bring balls, discs, jump ropes, kites, skateboards, and other friends to join in running around. Think of childhood games you liked to play and do them. Remember Kick the Can? Four Square? Wheelbarrows? Hopscotch? Sounds like a memorable play date/vacation, doesn’t it? Love Harry Potter? Wizards and Witches get your brooms ready! Did you know that over 250 universities, high schools and clubs in 33 countries have Quidditch teams? There is even a World Cup that has 80 teams from around the world competing in full-contact, co-ed combat. While it’s fierce and fun, you can start smaller in your own backyard or sidewalk. Get out a broom or stick off a tree. Quidditch is a blend of rugby, dodgeball, handball and even some capture the flag. Here are the “official” rules. However, you can start small and just practice shooting balls through rings while riding your broom. The more into it you are, the more fun and crazy it gets. Create a Quaffle ball, Bludgers or even the Golden Snitch. Gather neighbors, school friends and parents to play seven on seven. Who will be the Seeker and Captain? Start practicing, er, flying around the field! Go Hogwarts! Skipping is actually really great exercise. Skip high, long, low, slow, fast and sideways both directions. It’s fun and quite effective. 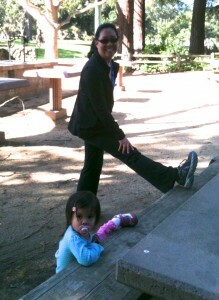 She walked over and copied her Mom stretching. It’s truly never too early to role model. So our bodies move in multiple planes: think front and back and side to side. Create a game – either oral, with cards or dice that challenges the other person to move in all directions. A simple version for toddlers to kids (and their parents to join in!) is a dice game such as the one featured here. This is an excellent game you can make as easy, creative or challenging as you want. For older kids and adults, you can have fun learning anatomical terms to describe planes of movement by making a card game. If you exercise and have never thought about how your body moves, it’s pretty interesting! Put the cards in the middle of the table and turn over two cards. The person who moves correctly at their turn according to his/her card, keeps the cards. Alternatively, race, and whoever can do the move the fastest keeps the cards. The person with the most cards at the end wins the game! What goes on the cards? A body part and one of the four planes of motion. The sagittal plane divides the body into right and left, so every time you take a step forward or do a bicep curl, you are moving in the sagittal plane. You can even add a more difficult layer to the game by talking about flexion (curling your arm up for the bicep curl) or extension (the lowering phase of the curl). Can you challenge each other to come up with new movements for each one? There is also the transverse plane that divides the body into top and bottom. Motion in the transverse plane is rotational around the axis of your spine. Think of swinging a baseball bat. The last plane of motion is circumduction, which is the combination of all three planes above, such as drawing circles with your arms or legs. If you get really into this, there are a lot of other terms to explore such as how the foot moves (dorsiflexion and plantar flexion), the ways the wrists move (pronation and supination), etc. The goal is not to get overwhelmed, but to explore the movement of your body with mindfulness, appreciation, and a sense of fun. If you are still reading this, bravo! You are on your way to super body awareness! “It’s not about telling kids not to do something, or that they are doing something wrong. It’s all about putting kids and families together to exercise and create momentum to making a positive change in how they can view food and exercise as the good guys, not the enemies.” Paul Stricker, MD a quote from this sobering paper. The solutions in this article are all doable! Mother and five-year old daughter “Run for Japan” in honor of the second anniversary of the earthquake. One of the questions I’m asked the most as a fitness teacher is “How do I easily incorporate exercise into my everyday life?” There are so many ways to answer this question, but one way is to start with the bathtub (or the sink if you have have a single stall shower). Your tub and/or counter offers a myriad of strength-training opportunities. While watching your child bathe in the tub (or just doing all this next to an older child as a way to spend time and grow stronger together), place your hands on the side of the tub and do push-ups (either on your knees on a rolled up towel, or toes if you have space). Place a kiss on your child’s head each time you go down. You’ll be motivated to do even more push-ups upon hearing the giggles. If you have a sink and no tub, then just do push-ups on the sink top. While you are in the position, hold a plank, a one legged plank, a side plank, or moving side plank – dropping just your hip down and up from the floor. With all of these moves, please be very careful of a slippery, wet side of the tub if you are doing them while your child is playing. Alternatively, use the sink top. Turn over and do triceps dips just bending your elbows. Or hold the triceps dip position with your toes off the floor, and drop your hips down and up for super glute strength. 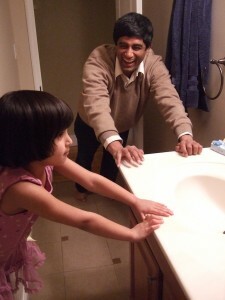 If you are bathing a young child, hold a deep squat rather than kneeling on the floor. Or side lunge, and when one side is fatigued, lunge the other direction all while shampooing. 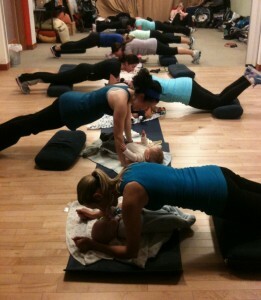 Combine strengthening your lower body at the same time you bathe your child! If you don’t have a tub, do the same deep squats at the sink while brushing your teeth. If you have an older child and a dry tub, carefully use the side of the tub as a place to do step-ups. Because the tub side is narrow, use the corner where it is wider. I like to move in super slow motion to make it more challenging. Add a high knee or side leg lift just for pizzazz. Compete with your child who can do the most step-ups. I bet you’ll be sore the next day. Lie on your back on the floor with your feet up on the tub. Lift your hips up and down, side to side, and in every manner you can think of to strengthen your hamstrings and glutes. Try one or all of these little simple moves. They’re free, you won’t even sweat so much you need a bath (ha ha), the “equipment” is already in your house, it’s straightforward, and you’ll have snuck great strength training into your day all while hanging out with your kiddo.